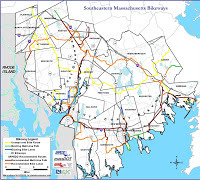 The Southeastern (Massachusetts) Regional Planning & Economic Development District (SRPEDD) has been involved in the planning and building of safe bikeways in that region, with several miles of bikeways already built and many more miles in the planning stage. These paths, onroad routes and dedicated bicycle lanes are in Fairhaven, Mattapoisett, Fall River, New Bedford, Swansea and Mansfield. The goal is to have a continuous for recreation and commuting, with the ultimate plan being a continuous path from Rhode Island to Cape Cod. SRPEDD has produced a two page bicycle route map, which you can download by clicking on the map on the left. Ride your chain back on, without touching it!